Safety and convenience are the key features with the U-Base Patient Lift. It rolls smoothly on four, 4" swivel casters and locks safely in place when front caster locks are activated. 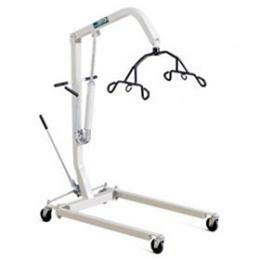 It can be adjusted from a normal width of 24" to as wide as 39 1/2' making close positioning to a wheelchair easy. Close access to patient beds is convenient too, thanks to its low base height of 5 1/2". And because the base and mast can be unlocked and separated, transportation and compact storage are easy as well. Plus, slings are available in two styles to accommodate individual patient requirements. 400 lb weight capacity.